Fans of the San Diego Chargers and Arizona Cardinals both have good reason to look forward to the2018 season. The Chargers showed appeared to be on the verge of becoming a playoff team last season. But they fell short once again. As for the Cardinals, there are promising players all over the field. But can they put it all together? Of course, during the preseason, we will not be able to tell if either team is going to be playoff worthy. But we can get our first look at some promising rookies, some new veterans, and a couple of healthy stars. Overall, there was some promising play on both sides of the ball for both teams. It is the preseason, of course, so any observations have to be taken with a grain of salt. But until the regular season begins, it’s all we have to go on. Cardinals running back Chase Edmonds scored the best two-yard touchdown run you’ll ever see. It probably shouldn’t have counted; there are a couple of instances where his knee appears to touch. But the refs never called him down, and they didn’t think there was enough proof in the video to overturn the call. Touchdown or not, you have to love seeing the kind of drive he showed on the play. Sam Bradford (1-1 for six yards) will be the starting QB for the Cardinals as long as he’s healthy. 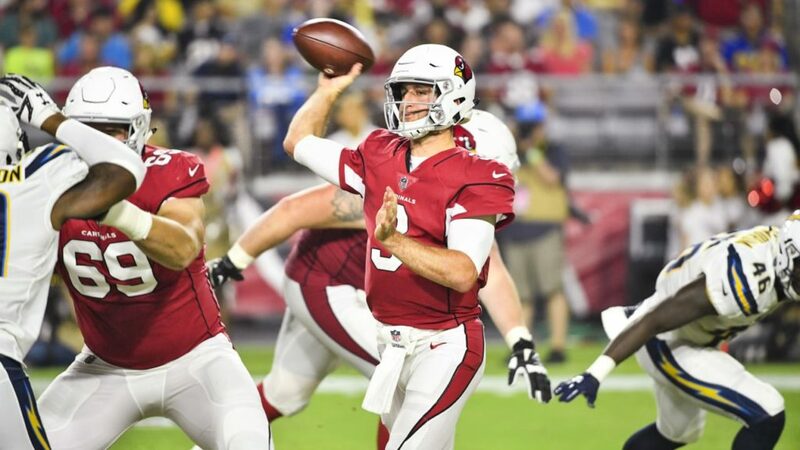 His one pass looked nice, but he’ll keep the job more because Josh Rosen (6-13 for 41 yards) is not ready. Part of the reason he looks far from ready was the lack of protection and trouble getting the snap. But a starting QB in the NFL has to be able to roll with the punches a lot better than he did. However, if the starting offensive line can’t do a better job, Sam Bradford could get hurt giving them no choice but to inset Rosen. Because they will certainly not want to go with Mike Glennon (2-7 for 11 yards and an interception). Go ahead and take David Johnson in the first round of your fantasy football drafts. He only had two carries, but they each went for 14 yards. He’s back. Christian Kirk is the real deal. He nearly scored a touchdown the first time he touched the ball (on a punt return) in the NFL (like he did in college). But he stumbled over his own shadow when he only had Chargers punter and former teammate, Drew Kaser, to beat. “I gave him the benefit of the doubt, thought he could run a little bit,” Kirk joked after the game. Chad Kanoff should play in the spring league if he doesn’t make the final roster. It doesn’t matter that he played in the fourth quarter against scrubs. His throws were on the money and looked great. Keep an eye on Cardinals defensive end Cap Capi (three sacks and one forced fumble). It sounds crazy to say, but Geno Smith didn’t look bad (14-23 for 218 yards and one touchdown and one interception). Cardale Jones certainly didn’t impress (6-12 for 50 yards). Neither did rookie Nic Shimonek (8-14 for 39 yards). The Chargers were the definition of sloppy—15 penalties for 155 yards and four turnovers (three fumbles and one interception). For those who keep score, the Cardinals won, 24-17. The Chargers will take on the Seahawks in preseason action next week on Saturday night. The Cardinals will face the Saints Friday night in New Orleans.